Some of the wonderful Monkeybiz creations. 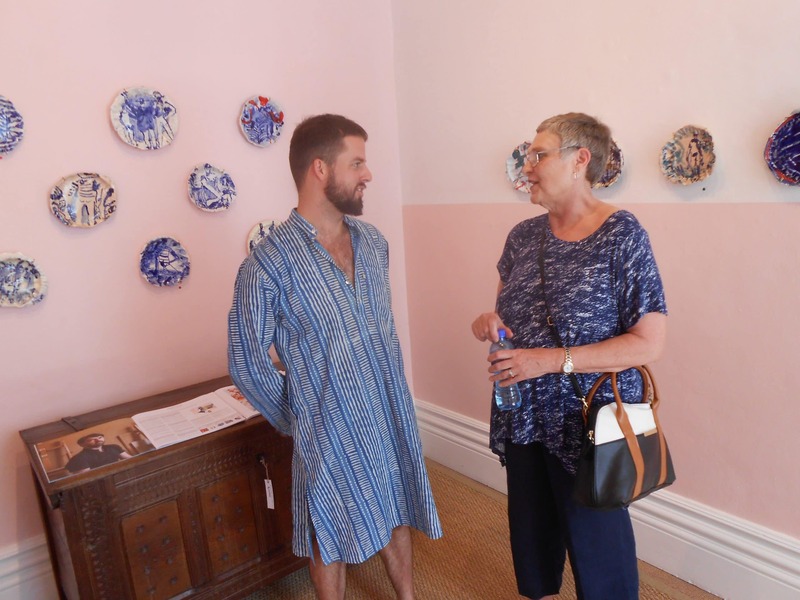 Cape Town is buzzing with creative flair and I so love introducing tourists from all over the world to a taste of local South African arts, crafts and unique home-grown creativity in the Bo-Kaap and Church Street. Coupled with a dose of social entrepreneurship it is a winning combination. So often time is limited, but two hours spent browsing these special discoveries in the centre of Cape Town is a transporting and inspiring experience. The first stop is Monkeybiz, which is dedicated to reviving the tradition of African beadwork whilst providing employment. You might wonder what well-known US designer Donna Karan and the Cooper Hewitt Smithsonian Design Museum in New York have in common with women beading in Cape Town townships. 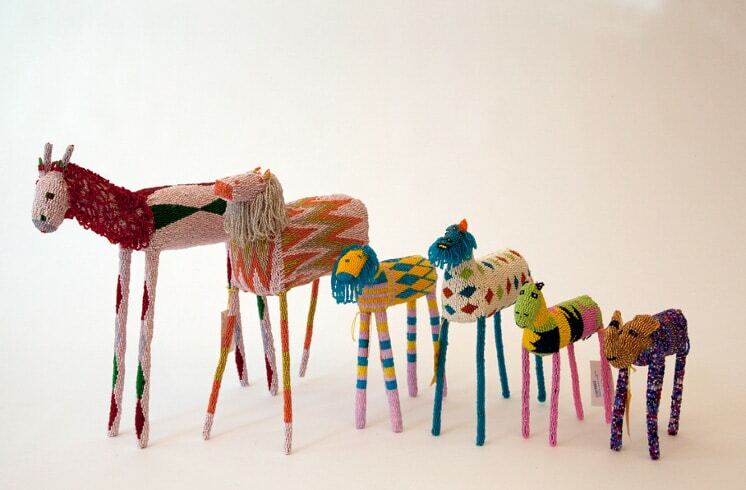 Climb the steps of the Rocksole building opposite Atlas Trading in the Bo-Kaap and enter into a magical world of brightly beaded whimsical characters to find out. The brainchild of the late ceramicist, Barbara Jackson and Shirley Fintz, Monkeybiz started in 1999 when one of their students, Mathapelo Ngaka asked her mother, a bead artist, to make a unique bead doll. Today this empowering project has over 300 active beaders on its register. The name came about when they were ‘monkeying’ around – But Monkeybiz is in fact a serious business changing the lives of hundreds of families on the Cape Flats. When you pop into the showroom you are warmly welcomed and invited to view the DVD showing the Monkeybiz journey. Many a foreign guest moved by the project has been more than happy to buy a memento and thus support this worthwhile initiative. Back to the American designers who recognising the value of this project and the ancient craft of beading have collaborated in various ways to showcase Monkeybiz products to the world. Owner Michael Chandler in his gallery @ Chandler House is always happy to chat. Michael Chandler of Chandler House features in Elbe Coetsee’ s absolute must-have ‘bible’ of ‘Craft Art in South Africa – Creative Intersections’ as one of the new designers to watch. Pop into his magical Chandler House at 53 Church Street described as ‘a small Design Studio, Antique Shop & Art Gallery that Celebrates the Old and New, Rare and Beautiful’ and you will be sure to find something creative inspired by our heritage and living in this part of the world. His VOC – Dutch East India Company inspired designs and the fantastic Cakes of Good Soap make brilliant gifts. Apart from the quirky play on words – and most tourists do make it to the Cape of Good Hope – the soaps are fashioned by a backyard entrepreneur making a living and is a feel good story. Michael himself is often to be found in his store and always happy to chat. Meandering along you will find SMITH Studio at 56 Church Street with wonderful exhibitions highlighting local South African talent. 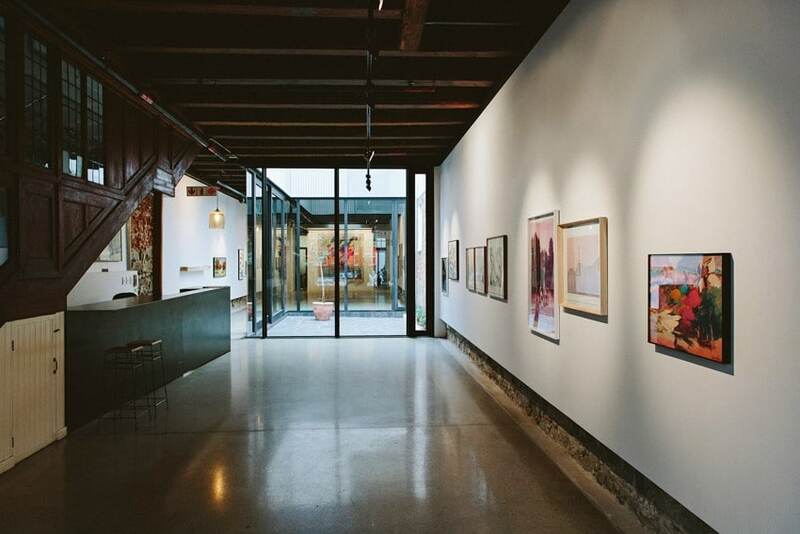 The space is manageable to navigate and offers a fresh insight into the local fine art scene. You might be lucky enough to have Curator Amy Ellenbogen give you a personal tour on what is currently showing. Next stop heading down Church Street on the left is The Gallery Shop – managed by the lady who used to run the gift shop at the South African National Gallery. She has a great selection of unique quality gifts personally chosen and the story behind which she is happy to share. Whether it be real ostrich shell bead necklaces fashioned by the Bushmen themselves or handmade jewellery, accessories and artefacts from all over the country, much of it made by women, you will find it difficult to leave, and it will definitely not be empty-handed! A coffee is called for and there are plenty of good options in this part of town including Doppio Zero which is just next to the Mandela Rhodes atrium – the perfect place to rest weary tourist legs and take a visual tour of Nelson Mandela’s life whilst sitting in comfortable sofas. Situated on the pedestrian zone of St George’s Mall step back in time and have a quick squiz into the expansive and elegant lobby of the gorgeous Taj Hotel and former Reserve Bank building – the staff are terribly friendly and the bathrooms are worth checking out. Last but not least is a visit to the Mogalakwena Craft Art Gallery at number 3 Church Street which was established in 2008. Step into this quiet space and be astounded by this leader in social entrepreneurship, the local craftsmanship and beautiful products. Elbe Coetsee is a truly inspiring woman and her book on Craft Art in South Africa is well researched and beautifully published. In mid-life she completed a PhD which focussed on the demographic characteristics and entrepreneurial attitudes of craft artists in South Africa. The foundation she started in 1994 in Limpopo where she also has a guest lodge and Artist’s retreat aims to provide training and employment in craft art for unemployed people who produce beadwork, candles, basketry and pottery. A two hour meander from the Bo-Kaap down Church Street filled with inspiring stories and beautiful craft is something no visitor to the heart of Cape Town, local or foreign, should miss out on. It sounds fascinating; am going to explore Church Street; so far I’m familiar only with Long Street. I need to get off the tourist buses and explore Cape Town’s quirky corners and these galleries. Great blog!